Ever hear of the Baader-Meinhof Phenomenon? It’s more commonly known as the “frequency illusion,” as coined by Arnold Zwicky to describe the syndrome in which a concept or thing you just found out about suddenly seems to crop up everywhere. 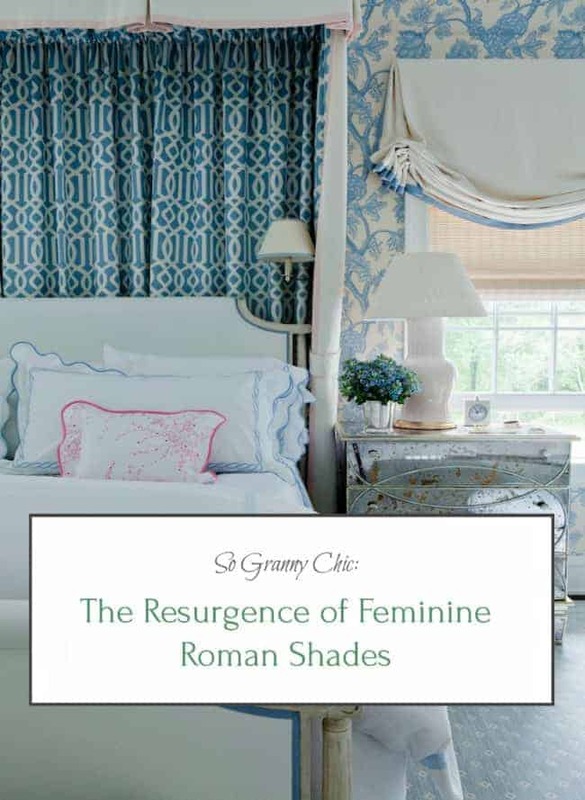 Well, I’ve been having a lot of frequency illusions lately when it comes to feminine Roman shades. And I don’t mean a feminine-themed choice of fabric, I mean a feminine shape. As I detailed in my Thursday post about Home Glow’s newest One Room Challenge, “The Ultimate She-Shed,” I want to do some sort of feminine Roman shades to balance all the masculine history of the project (the building used to be a blacksmith’s shop). You can read more about the colors and patterns (which are also slightly girly) in that post, but here I want to talk about the style of shade. When you think of a feminine line stylistically speaking, most people think of curves and softness. Now apply that to Roman shades. The easiest is a relaxed Roman, which I use often in my design work. These are simple, casual, and yet still lovely in the most formal settings. However, for the Ultimate She-Shed I want something even more feminine. I loved this example by Ashley Whittaker. Ashley kind of straddles the line between a relaxed Roman with dogs ears and a full-on London Shade. In the dog-ear style, the draw cords are inset a certain amount, but the panel is still essentially flat. In the London shade, the cords are centered in two pleats at the top. In either style, the length of the dog ear is totally up to the designer, the longer creating a more formal feel. I’ll bring up the picture of Ashley’s favored style again, so you can see how she blends the two. Her pleat is at the corner of the window, creating a return to the wall with a shorter dog ear. You get the fullness of the London without the fussiness. I LOOOOOOOOVE it!! And so began my frequency illusion with these more feminine Roman shades. Source unknown. This room was a big inspiration for this dining room. Or course, I recommend working with a designer on custom window treatments. 😉 He/she will have access to more ideas, fabrics, and trims than you can dream of, and you’ll have the confidence in knowing that your measurements will be right. 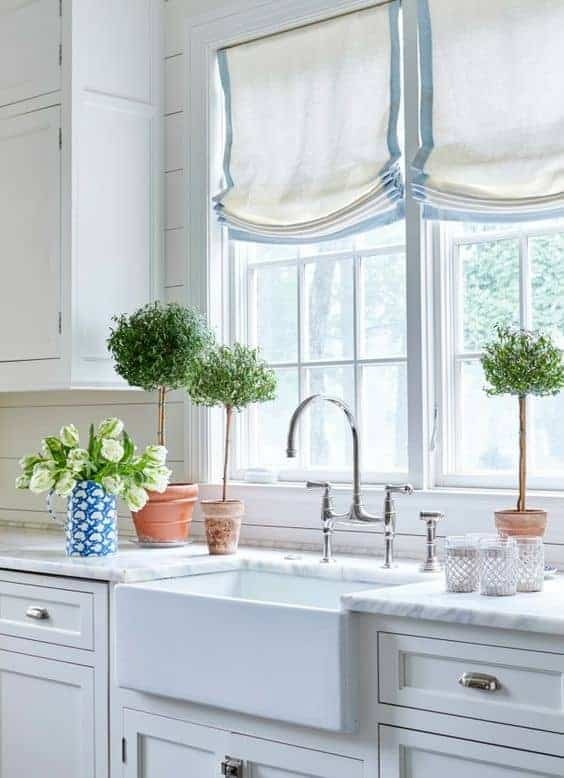 However, if you want this kind of window treatment and you’re serving as your own designer (like in this post), I highly recommend Lynn Chalk on Etsy. She does gorgeous work. Now, some Big Box outlets like Loom Decor and The Shade Store call this style “Tulip Shades,” probably because they’re afraid “London shade” many sound too formal to xennials and millenials. However, just note that when you go big box, you lose the ability to customize fabric, dog ear length, pleat depth, return, width of banding, contrast fabric on the inverted pleats, etc. without really saving any $$ in return. So what do you think of these feminine shades? Yea or nay? That’s a Wrap! Matching Your Walls, Windows, & More… and Sources! Check back in on Thursday for an update on my One Room Challenge and to see which of the dueling schemes I chose! I’ll have some juicy info in there, too. I promise.